The speedup of a program using multiple processors in parallel computing is limited by the sequential fraction of the program. For example, if 95% of the program can be parallelized, the theoretical maximum speedup using parallel computing would be 20× as shown in the diagram, no matter how many processors are used. Amdahl's law, also known as Amdahl's argument, is named after computer architect Gene Amdahl, and is used to find the maximum expected improvement to an overall system when only part of the system is improved. It is often used in parallel computing to predict the theoretical maximum speedup using multiple processors. The speedup of a program using multiple processors in parallel computing is limited by the time needed for the sequential fraction of the program. For example, if a program needs 20 hours using a single processor core, and a particular portion of 1 hour cannot be parallelized, while the remaining promising portion of 19 hours (95%) can be parallelized, then regardless of how many processors we devote to a parallelized execution of this program, the minimum execution time cannot be less than that critical 1 hour. Hence the speed up is limited up to 20×, as the diagram illustrates. Amdahl's law is a model for the relationship between the expected speedup of parallelized implementations of an algorithm relative to the serial algorithm, under the assumption that the problem size remains the same when parallelized. For example, if for a given problem size a parallelized implementation of an algorithm can run 12% of the algorithm's operations arbitrarily quick (while the remaining 88% of the operations are not parallelizable), Amdahl's law states that the maximum speedup of the parallelized version is 1/(1 – 0.12) = 1.136 times faster than the non-parallelized implementation. To see how this formula was derived, assume that the running time of the old computation was 1, for some unit of time. The running time of the new computation will be the length of time the unimproved fraction takes, (which is 1 − P), plus the length of time the improved fraction takes. The length of time for the improved part of the computation is the length of the improved part's former running time divided by the speedup, making the length of time of the improved part P/S. The final speedup is computed by dividing the old running time by the new running time, which is what the above formula does. or a little less than ½ the original running time which we know is 1. Therefore the overall speed boost is 1 / 0.4575 = 2.186 or a little more than double the original speed using the formula (P1/S1 + P2/S2 + P3/S3 + P4/S4)−1. Notice how the 20× and 5× speedup don't have much effect on the overall speed boost and running time when 11% is not sped up, and 48% is sped up by 1.6×. In the limit, as N tends to infinity, the maximum speedup tends to 1 / (1 − P). In practice, performance to price ratio falls rapidly as N is increased once there is even a small component of (1 − P). As an example, if P is 90%, then (1 − P) is 10%, and the problem can be speed up by a maximum of a factor of 10, no matter how large the value of N used. For this reason, parallel computing is only useful for either small numbers of processors, or problems with very high values of P: so-called embarrassingly parallel problems. A great part of the craft of parallel programming consists of attempting to reduce the component (1 – P) to the smallest possible value. P estimated in this way can then be used in Amdahl's law to predict speedup for a different number of processors. Amdahl's law is often conflated with the law of diminishing returns, whereas only a special case of applying Amdahl's law demonstrates 'law of diminishing returns'. If one picks optimally (in terms of the achieved speed-up) what to improve, then one will see monotonically decreasing improvements as one improves. If, however, one picks non-optimally, after improving a sub-optimal component and moving on to improve a more optimal component, one can see an increase in return. Consider, for instance, the illustration. If one picks to work on B then A, one finds an increase in return. If, instead, one works on improving A then B, one will find a diminishing return. Thus, strictly speaking, only one (optimal case) can appropriately be said to demonstrate the 'law of diminishing returns'. Note that it is often rational to improve a system in an order that is "non-optimal" in this sense, given that some improvements are more difficult or consuming of development time than others. 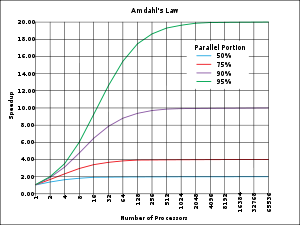 Amdahl's law does represent the law of diminishing returns if you are considering what sort of return you get by adding more processors to a machine, if you are running a fixed-size computation that will use all available processors to their capacity. Each new processor you add to the system will add less usable power than the previous one. Each time you double the number of processors the speedup ratio will diminish, as the total throughput heads toward the limit of 1 / (1 − P). This analysis neglects other potential bottlenecks such as memory bandwidth and I/O bandwidth, if they do not scale with the number of processors; however, taking into account such bottlenecks would tend to further demonstrate the diminishing returns of only adding processors. Assume that a task has two independent parts, A and B. B takes roughly 25% of the time of the whole computation. By working very hard, one may be able to make this part 5 times faster, but this only reduces the time for the whole computation by a little. In contrast, one may need to perform less work to make part A be twice as fast. This will make the computation much faster than by optimizing part B, even though B speed-up by a greater ratio, (5× versus 2×). Improving part A by a factor of two will increase overall program speed by a factor of 1.6, which makes it 37.5% faster than the original computation. However, improving part B by a factor of five, which presumably requires more effort, will only achieve an overall speedup factor of 1.25, which makes it 20% faster. Amdahl, Gene (1967). "Validity of the Single Processor Approach to Achieving Large-Scale Computing Capabilities" (PDF). AFIPS Conference Proceedings (30): 483–485. http://www-inst.eecs.berkeley.edu/~n252/paper/Amdahl.pdf. Rodgers, David P. (June 1985). "Improvements in multiprocessor system design". ACM SIGARCH Computer Architecture News archive (New Yorok, NY, USA: ACM) 13 (3): 225–231. doi:10.1145/327070.327215. ISSN 0163-5964. http://portal.acm.org/citation.cfm?id=327215. "Amdahl's Law" by Joel F. Klein, Wolfram Demonstrations Project, 2007. Blog Post: "What the $#@! is Parallelism, Anyhow?" This page was last modified on 2 February 2010 at 16:31.